If you're a Minnesota native you're probably already aware that fair season means lots of questionable carnival rides, high-quality people watching and of course, lots of food on a stick. While we don't have anything deep-fried or on a stick to offer you, we do have plenty of creativity that will be featured at this year's Minnesota State Fair and the Dakota County Fair! 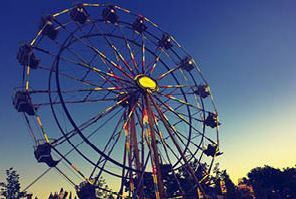 The Dakota County Fair is held in Farmington, MN throughout July and August. This year 3 different groups will be performing. On Tuesday, August 7th, Siama's Congo will come together to bring you the sounds of the Congo and the beauty of Africa. Leo and Kathy Lara will be performing Latin American Folkloric Music on August 8th. The duo blends indigenous, European and African elements and traditions. Finally, on Thursday, August 9th, PolksSol! will be playing Scandinavian, Irish, and French tunes... just to name a few! The end of summer is always punctuated by the great Minnesota get-together, AKA The Minnesota State Fair. We're thrilled to have two amazing performances on August 29th on the Dan Patch Stage. First, we have Ragamala Dance performing From Temple to Theater. These beautifully performed routines trace the evolution of the dance form Bharatanatyam, from the ancient temples of South India to the theaters of today. Later in the day, BRKFST will be popping, locking, and dropping on the stage. BRKFST provides a performance utilizing foundational breaking (breakdancing) with contemporary and experimental concepts that will both educate and inspire. These are rare opportunities to catch these great performances and you don't want to miss out. Many times our artists are in private spaces not seen by the general public. These are the days to get out and see for yourself the life-changing creative experiences we provide for participants everyday. Corn-dogs and cheese curds are just an extra-bonus.